Today, I mailed my second letters to Bob Iger and Kathleen Kennedy. I will post the contents of my letter to Mr. Iger below. My first letters were hand written and not quite as in depth as these new ones. Oh course at that time, there were only rumors of the cancellation of The Clone Wars. I hope all of you who are passionate about The Clone Wars and about the Lucas era of Star Wars have reached out, to to Disney and LucasFilm, and will continue to do so. Please save The Clone Wars. I am a 35 year old man who has literally grown up with Star Wars, and I have never known a world without it. I was glad to hear that with Disney’s purchase of LucasFilm more Star Wars movies are coming soon. As a huge fan of the show Star Wars: The Clone Wars, I’m writing this letter, and I have included a string of beads inspired by Ahsoka Tano’s Padawan braid, to express my desire for this show to continue. We know the show has been cancelled, and the latest reports are that the team that makes this wonderful series is being disbanded. I hope you realize that this is a big mistake. The voice actors have brought these beloved characters to life in new ways. As a fan of the show, the actors like James Arnold Taylor, Matt Lanter, Dee Bradley Baker, Ashley Eckstein, and Tom Kane have added a depth and realism to the beautiful animation. Also, these generous people have been very kind to Star Wars fans, and they have made great ambassadors for the Star Wars brand. Star Wars: The Clone Wars is very popular, and it has introduced a new generation to the property that Disney purchased. This whole new generation of Star Wars fans will be greatly disappointed since their “Star Wars” has been cut short. 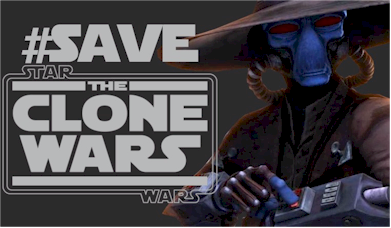 I love Star Wars and have been reaching out on social media, Twitter and Facebook, to other fans who are also using the hashtag #SaveTheCloneWars. Last week, I started SaveTheCloneWars.com to spread the word about the campaign to try to get you to change your mind. We have had thousands of people visit our website, Facebook, and twitter. Many of my fellow Star Wars fans have told us and even sent us picture of their letters that they were sending in, and some have also sent us pictures of the beads that they are sending as well. I kindly ask you to please give Star Wars: The Clone Wars the chance it deserves and allow these wonderfully talented people that create the show to have the chance to complete it the way that Dave Filoni and George Lucas intended.